He writes, "I have to laugh at stop lights here - seeing people take pictures and some honking their horns." Of course not everyone was happy with his bumper sticker: "one lady pulled up next to me and shook her finger at me, scolding me!" But Butch isn't alone in seeing some negative reactions - as we see in this post by Joanna Brooks - but much of the reaction has been positive. And even when it wasn't, we found it humorous all the same. In fact, many people found this website and Facebook group because of the bumper stickers on your cars or the t-shirt that you casually wore to the grocery store. One woman emailed that she was tailed down the street, and when she finally exited her car, her follower asked, "where did you get that bumper sticker? I need one!" Read this wonderful post by Jana Reiss about her thoughts on the bumper sticker and how the conjunction "and" is not enough. 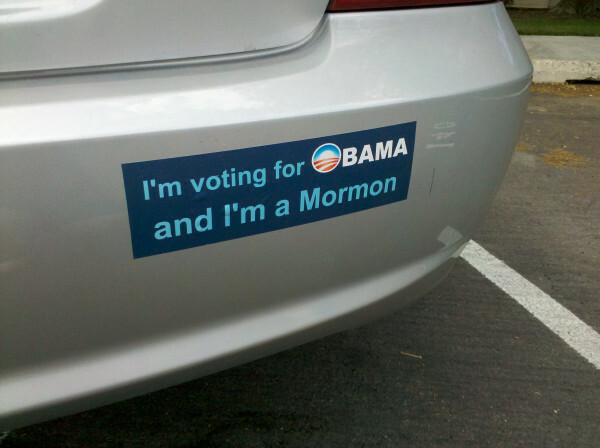 Admittedly, we Mormons for Obama have a lot to be thankful for this season. 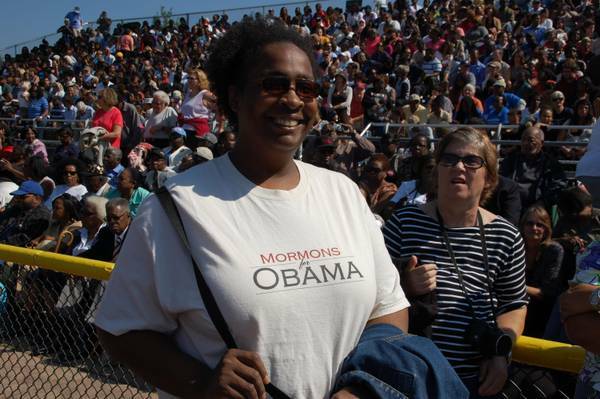 Also, we were pleased to discover that Mormons actually voted for Obama in higher numbers than those who voted Democrat in 2004 when Bush was reelected. (Or said another way, GW Bush received more Mormon votes than did Romney.) See this article from Business Insider, and thank you to Dave in Seattle for emailing this to us.